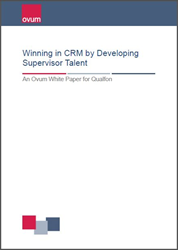 Qualfon's Leadership Academy is featured as a case for success in a new Ovum publication that addresses ways to build leadership in order to win at customer relationship management. The report calls out Leadership Academy’s “intriguing and progressive approach” that equips supervisors to “handle the evolving needs of frontline contact center management, resulting in more motivated agents and lower attrition." Qualfon, a people-driven business process outsourcing (BPO) company and global provider of contact center services, and its Leadership Academy program are featured as a case for success in a new Ovum publication that addresses ways to build leadership in order to win at customer relationship management (CRM). The case study, Winning at Customer Relationship Management by Developing Supervisor Talent, explores the most pressing challenges that contact center managers face today and the requirements that their third-party partners must have to help overcome them. Qualfon is highlighted as an example of a BPO partner that has made investments in frontline leadership, enabling clients to improve customer experience quality, increase service flexibility and speed, and reduce operational costs. The report specifically calls out Leadership Academy’s “intriguing and progressive approach” that equips supervisors to “handle the evolving needs of frontline contact center management, resulting in more motivated agents, lower attrition and higher levels of customer satisfaction.” Laying out Qualfon’s case, the publication investigates two complex operational challenges that Leadership Academy graduates solved using their new skills. Based on Six Sigma certified techniques and management best practices, the solution eliminated disputes and reduced the number of tier-1 customer service calls by nearly 1/3.